even irresponsible--to continue to deploy concepts that were useful and valid during the period of anticolonial struggle. Decolonization and the Decolonized contributes to the most current debates on Islamophobia in France, the "new" anti-Semitism, and the unrelenting poverty gripping the African continent. Memmi, who is Jewish, was born and raised in Tunis, and focuses primarily on what he calls the Arab-Muslim condition, while also incorporating comparisons with South America, Asia, Black Africa, and the United States. 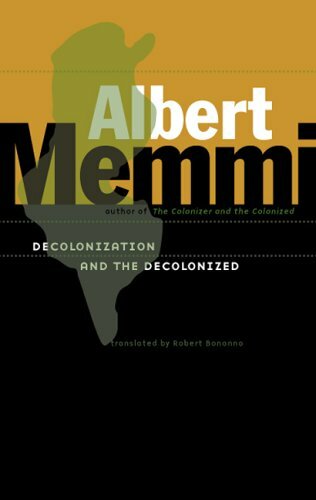 In Decolonization and the Decolonized, Memmi has written that rare book--a manifesto informed by intellect and animated by passion--that will propel public analysis of the most urgent global issues to a new level. Albert Memmi is professor emeritus of sociology at the University of Paris, Nanterre, and the author of Racism (Minnesota, 1997). Robert Bononno, a teacher and translator, lives in New York City. Albert Memmi was born in Tunis in 1920. He has taught philosophy both in Tunis and Paris. Professor of English and Chester D. Tripp Professor in the Humanities at the University of Chicago, Homi K. Bhabha is the author of The Location of Culture.